Sec. 17-2. – Low-speed vehicles. (a) Definition of low speed vehicle. Pursuant to F.S. § 320.01(42), a low-speed vehicle is any four-wheeled electric vehicle whose top speed is greater than twenty (20) miles per hour but not greater than twenty-five (25) miles per hour, including neighborhood electric vehicles. Said vehicles must conform to the safety standards in 49 C.F.R. Section 571.500 and F.S. § 316.2122. For purposes of this section, “golf carts” as defined in F.S. § 320.01(22) or “speed modified golf carts” shall not be considered “low-speed vehicles” and shall be subject to the specific rules and regulations governing golf carts adopted by the Town of Lady Lake and the private rules and regulations established by the communities in which they are operating. (b) Authorization to operate low-speed vehicles. Low-speed vehicles may be operated within the Town limits where the posted speed limit is thirty-five (35) miles per hour or less. Pursuant to F.S. § 316.2122(1), this does not prohibit a low-speed vehicle from crossing a road or street at an intersection where the road or street has a posted speed limit of more than thirty-five (35) miles per hour. (c) Equipment and minimum standards. According to the requirements set forth in F.S. § 316.2122, a low-speed vehicle must be equipped with headlamps, stop lamps, turn signal lamps, tail lamps, reflex reflectors, parking brakes, rearview mirrors, windshields, seat belts and vehicle identification numbers. A low-speed vehicle must be registered and insured in accordance with F.S. § 320.02. Any person operating a low-speed vehicle must have in his or her possession a valid driver’s license. (d) Hours of operation. Low-speed vehicles may be operated at any time. (e) Compliance with traffic laws. Low-speed vehicles shall comply with all local and state traffic laws, and may be ticketed for traffic violations in the same manner as motor vehicles. (f) Enforcement. The Town of Lady Lake shall have the authority to enforce the provisions set forth herein and applicable traffic laws, provided however, that the enforcement of additional rules and regulations established by communities in which they are operating shall be the sole responsibility of said communities. Editor’s note—Section 7 of Res. No. 2003-109, adopted May 19, 2003, repealed Res. No. 2003-103, from which § 17-2 derived. Sections 1—6 of said resolution enacted similar provisions to read as set out herein. Sec. 17-3. – Operation of golf carts. (l) Definition of “golf cart”. Pursuant to F.S. § 320.01(22), a “golf cart” is defined as a motor vehicle that is designed and manufactured for operation on a golf course for sporting or recreational purposes and that is not capable of exceeding speeds of twenty (20) miles per hour. (2) Authorization to operate golf carts within golf cart communities. Golf carts meeting the definition set forth in subsection (1) above may be operated within communities recognized by the town commission as “golf cart communities” on such streets designated therein for golf cart usage. 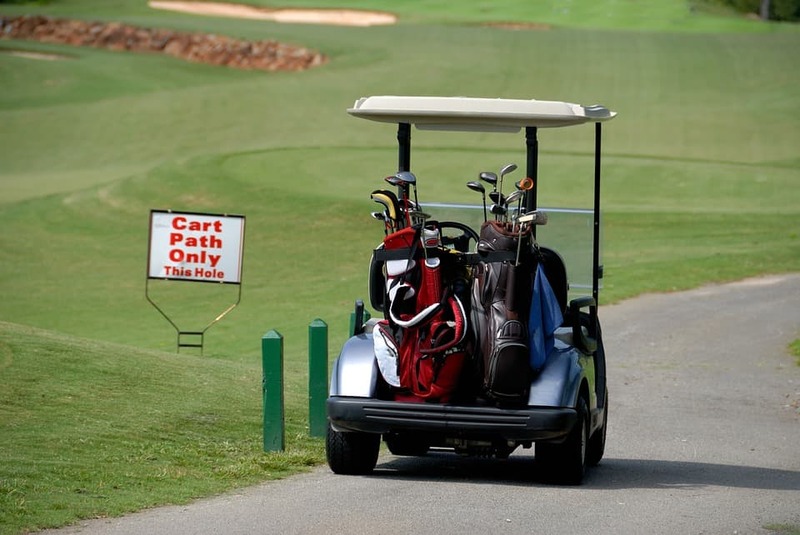 Each golf cart community shall provide signage regulating the use of golf carts and designating streets or other areas where golf carts may be operated. Speed-modified golf carts or “hybrid” golf carts are not authorized for use on streets within golf cart communities. (3) Equipment and minimum standards. All golf carts operated within golf cart communities shall meet the minimum equipment standards established by Florida Statutes. Golf carts that are operated between the hours before sunrise and after sunset must be equipped with headlights, brake lights, turn signals, and a windshield. The town commission strongly recommends the placement of reflective devices on the sides of golf carts driven before sunrise and after sunset, such as reflective tape. (4) Hours of operation. Golf carts meeting the equipment standards established in subsection (3) above for operation between the hours before sunrise and after sunset, may be operated at anytime during the day or night. Golf carts that do not meet these additional standards shall only be operated during the hours between sunrise and sunset. (5) Compliance with traffic laws. Golf carts shall comply with all applicable local and State traffic laws, and may be ticketed for traffic violations in the same manner as motor vehicles. (6) Enforcement. The Town of Lady Lake shall have the authority to enforce the provisions set forth herein and applicable traffic laws, provided however, that the enforcement of rules and regulations established by golf cart communities shall be the sole responsibility of each community. (7) Conflicts. All resolutions or parts of resolutions in conflict with any of the provisions of this section are hereby repealed. This section shall not repeal prior resolutions or provisions that established specific golf cart communities, nor prevent the establishment of additional golf cart communities within the town.